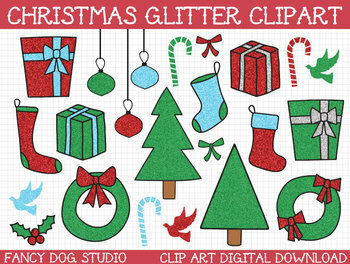 Glitter Christmas clip art icons. Trees, packages, stockings, doves, candy canes and ornaments. Each Christmas icon is saved as an individual image. INFRINGEMENT FREE GUARANTEE: I personally guarantee that all artwork is 100% original, created by Paula Kim Studio. By using PKS artwork in your products, you are ensuring that you are not infringing on the copyrights of any unknown third parties.